We are going to have NATION STATES. We will have an IGBO NATION WITHIN BIAFRA. We will have an EFIK NATION WITHIN BIAFRA. 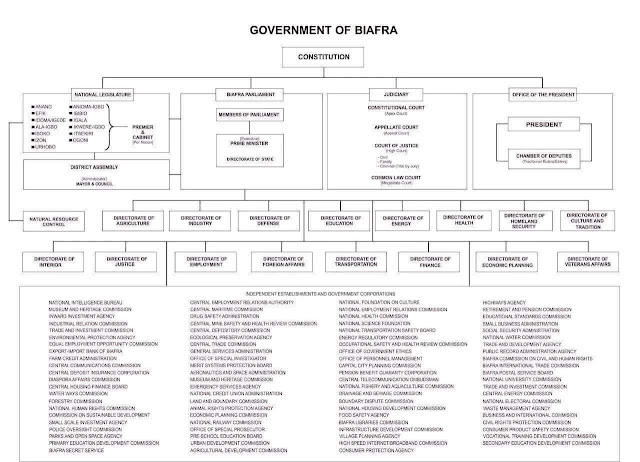 We will have ANNANG NATION WITHIN BIAFRA, if they so choose. We will also have IJAW NATION WITHIN BIAFRA. We will have ISOKO NATION WITHIN BIAFRA. We will have IDOMA NATION WITHIN BIAFRA. We will have IGALA NATION WITHIN BIAFRA. Listen to this: THEY WILL ALL BE AUTONOMOUS. Each Nation State will control the resources in their own land. The only thing that will bind us together will be a COMMON DEFENSE POLICY, COMMON ECONOMIC POLICY, COMMON POLICY IN HEALTH AND EDUCATION. In the rest, let people develop according to the pace that they wish or they decided amongst themselves to go by.